You’re Married & You Want To Change Your Name. Esquire Photography Partner; Simply Bridal Has A Great Wedding Tip To Help You With That! Good morning from EPHQ everyone! I’m knee-deep editing Christin & Christoph’s destination wedding in Mirow, Germany (here’s their totally romantic Portrait Shoot in Berlin!) and have probably one of the best Wedding Tips to share with you from my good friend and Partner of Esquire Photography; Shelly at Simply Bridal. This week Simply Bridal has put together an awesome graphic on how to change your name after your wedding day. Check out what Shelly shared for you! “So the wedding is over, phew… time to relax! Oh wait, but don’t forgot you’ve just gone from Miss to Mrs. It’s time to change your last name, there are so many important documents with your name on it that will need altering. 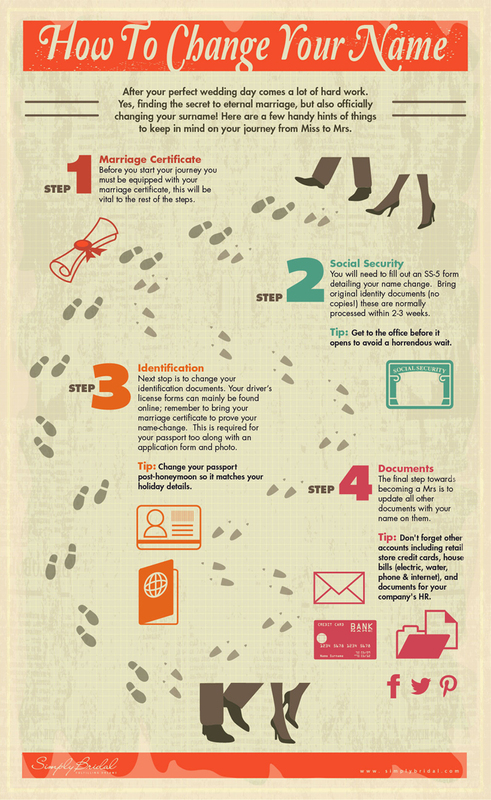 Make sure you have your Marriage Certificate before trying to make any leeway with any of the steps below. If you have any other wedding tips you’d like to add on how to make it easy & simple to change your name, be sure to share your thoughts in the comments below or contact me anytime day or night. I’m available just about 24/7 via Twitter, Facebook, Google+, the form on my contact page, or the old fashioned phone as well at 888.ESQ.PHTO (888.377.7486) or 562.225.5915. Thanks again to my friend; Shelly at Simply Bridal for the awesome tips on how to change your name for brides after their wedding day! That was really great of her to do that! I hope you’re having a great week and stay tuned for more amazing events that I’m sharing with you from around the world.